As 39 year old, Elizabeth Garza, explains her life as an English teacher, she quickly types on the keyboard. “I love storytelling,” she says, while looking around Room 353 to find the right words. “I am the oldest of two younger sisters,” she says with a smile. 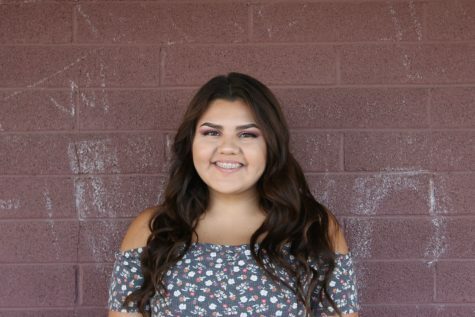 Garza is a local, born and raised in the Inland Empire; coming to Colton everyday to be the open-minded teacher she is. Her father has had the biggest impact in her life. “He just offers good advice in general and we talk a lot about work,” she said with a look of happiness and joy when remembering what he has done for her. But that look suddenly turned into fear when explaining the experience she has had with heights and swerving. “I am afraid to fall. One day I swerved to avoid a dog on the road, and I spun out; when I spun out I saw a car coming in my direction.” Readjusting herself to her comfort, she slowly notes, “…that scared the crap out of me,” the look of seriousness in her face soon turns into relief as she takes a deep breath to let go of that memory.